"Open The Door Richard" was a slice of black vaudeville, and on immense hit record in the 1940s, crossing over into the pop marketplace. Interestingly, many of the competing versions were quite different. Black music hall star Dusty Fletcher popularized the number, which dated back to a much earlier routine by John "Pider Bruce" Mason. Jack McVea's record became the biggest hit, though, and it was McVea's record that was generally copied, albeit with more variations, by the likes of Count Basie. All versions returned to the same chorus, which provided instant recognition, and the selling point. The tale of this record by Ernie Barton could keep a team of archaeologists in business. Among out most recent discoveries. First, the wonderful free spirit that you hear on this release did not emerge spontaneously off the floor; rather, it was layered together piece by piece - first the band track, then Barton's vocal, and finally the chorus. Second, many knowledgeable Sun collectors will recognize "Open The Door Richard", credited to Ernie Barton, has previously been released on several occasions as a Billy Riley title. The mistake is understandable. For one thing, Barton sounds a lot like Riley - two southern white boys talking and singing in jivey black style. For another, according to the Sun Records Discography by Escott and Hawkins, Billy Riley recorded a version of this title on November 25, 1957, over a year before the Barton session. It didn't help the confusion when the Barton version was stored on a Riley reel in the Sun vault. Recorded: - February 25, 1959 - Issued under Ernie Barton's name. The story behind "Big Man" has only recently come to light. Drummer J.M. Van Eaton recalls that the song's composer, Dale Fox, had booked the studio and Sun house band to record his tune. Things were going from bad to worse and Sam Phillips finally suggested that pianist Charlie Rich take a shot at the vocal. The results were highly impressive and a restrained chorus was overdubbed for release as a single. van Eaton recalls taking the unusual step of separately miking his bass drum, which became one of the arrangement's most distinctive features. "Big Man" is a wonderful record. Charlie's soulful vocal is at least five years ahead of its time. Otis Redding, Percy Sledge and Solomon Burke sounded like this in the mid-1960s, but this was early 1959 and, as this and several outtakes, Charlie was totally comfortable with the melisma and cadences of the black church long before they had been drawn into the musical mainstream. 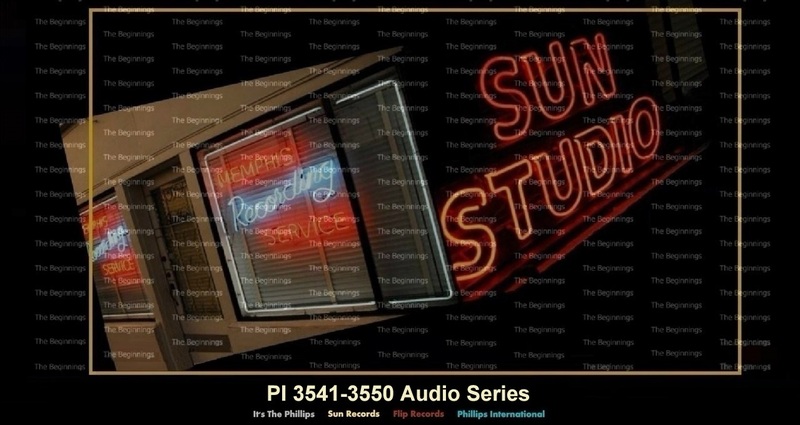 Cliff, Ed and Barbara Thomas were frequent visitors to the Sun studio during 1958. Their efforts resulted in three singles issued under the trio's name, and this, their final effort, issued by sister Barbara. It almost every case, the group laid down very competent and surprisingly commercial white pop music, with considerably more bite than most owing to Ed's bluesy piano and J.M. Van Eaton's drumming. Brad Suggs you say. First there were those three country ballads issued with the Slim Rhodes band back in 1955. Then between 1959 and 1961 Suggs had five singles issued on Phillips International. Virtually all of them were instrumentals with some novelty aspect to them. This two sides, issued in September 1959, were his first shot at the marketplace. "Rockin' Love", was a remake of the lone Carl Mann single on Jaxon Records, recorded prior to his pilgrimage to Memphis. The first half is a tight, tough little record that builds quite a bit of tension. And then it happens: the band speeds up and just when things should soar into the stratosphere, the sheer incompetence of one band member threatens to destroy the whole gig. Bass player Robert Oatsvall simply goes to piece. He can barely keep up with the changes awn manages to hit a few clams of near mythic proportion. In truth, it is a wonder that this take was released. Sam Phillips has often told of releasing records with technical imperfections because the feeling was right. "Down The Line" by Jerry Lee Lewis was one such case (listen to the guitar go out of tune). The Memphis Bells, cleverly named after the Mississippi paddlewheel boat, sound like an allgirl band, but in fact the group consisting of two organists, Shirley Sisk and her friend Bettye Jean Hodges, backed by the usual suspects. The ever- unreliable log sheets filed with the Union suggest that its Roland Janes, Billy Riley, Brad Suggs, Charlie Rich, J.M. Van Eaton, and Marty Willis. Bettye Jean, though, remembers that Bill Black was present, and as Smokey had yet to break, she might well be right. Bettye Jean had written many, many tunes, but the limit of her performing experience was playing in church and at organ recitals downtown during the holidays. She was, she says, pushed into recording by her husband and her mother. "Snow Job" wasn't really my style of music", she says, "but I was trying to go with what was selling. I hate to say it, but I had no perseverance, and that's what it takes". As a result, this is the one and only time that Bettye Jean appeared inside a recording studio. Shirley remembers that "Snow Job" got played quite often around Memphis, and even remembered hearing is as she was driving to California with her husband, but it wasn't the wintertime smash that it might have been. This was somebody's idea of a commercial record in 1959. It might have been subtitled "Tom Dooley Meets The Battle Of New Orleans". Ironically, this is the least interesting record Mack Self left in the Sun vaults, an ersatz folk concoction full of dramatic drum rolls and a wholly out-of-place sax. At least it gave them an excuse to resurrect and release "Mad At You" (1957), for which we should be deeply beholden to the hung down "Mr. Brown". "Mad At You", this delightful slice of rural life dates from Mack's earliest session at Sun and continued appearing on the session logs almost until the end. Dueting with bass player Jimmy Evans, Mack gives us a comic version of his troubles. He's mad at everything in sight - including both his girl and the world. His cow's gone dry, the hens won't lay, his tires are flat and he's got a hole in his Sunday hat. Those last two lines, by the way, came to Mack courtesy of Jack Clement. Clement had a listen to what Mack was working on, jotted the "ties are flat/Sunday hat" couplet down on a piece of paper and handed it to Mack in the studio. Two great minds worked together. All the complaining is quite good- natured and the song is wonderfully picked and sung. "Mad At You" offers a vivid glimpse at the identity of the elusive Mack Self. The verdict comes in Country. Country to the core. And back country at that. This record is a delight. Listen to those verses during the "mad at the world" segment. Cows, chickens, and a Sunday hat. How much further back into the country can you get? Self seems lost in another time zone. In fact, he kept making music that truly belonged in another decade (both this track and "Easy To Love", issued on SUN 273, are fine examples) and Sam Phillips, bless his heart, kept putting it out. Note that this track sat in the can for over two years before being released in October, 1959. The master was recorded in March 1957 and there are demos of "Mad At You" dating from February 1956, if not earlier. "On my first sessions at Sun, I had Therlow Brown playing hot guitar", recalled Mack Self, "and Jimmy Evans on upright bass. That was our band. Sam Phillips added Stan Kesler on steel and Carl Perkins' drummer W.S. ''Fluke'' Holland. Around that time, we cut "Goin' Crazy" and "Mad At You" but they were not released then. Around 1956 we cut some other songs, "Vibrate" was one. It was several years before Sam Phillips put out another record, which was "Willie Brown" and "Mad At You" on Phillips International".